This YA romantic comedy reflects traditional coming-of-age themes, further complicated by issues of sexuality and identity. 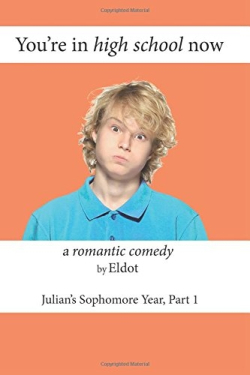 Eldot’s romantic comedy You’re in High School Now follows Julian, a young gay man in who is getting to know himself while creating his place in the world. This particular world is high school in 1962, a microcosm fraught with prizes and pitfalls, where bullies abound and fitting in is a constant quest. This narrative reflects traditional coming-of-age themes, further complicated by issues of sexuality and identity. These are sensitive topics for many readers, regardless of age, but Eldot writes with an urgency to connect with those young adult readers for whom these issues might be especially difficult. This story is an extension of Eldot’s earlier series, the Julian’s Private Scrapbook novels, but can be read in isolation. Readers should be aware it contains sexual content and adult themes layered throughout. Julian is a sympathetic character, thoughtful and comical in his observations about himself and those around him. His internal struggles and interactions with his peers will likely connect with young readers, regardless of gender or sexual orientation. Self-acceptance rings as a universal desire and pursuit throughout these pages. Although the writing is clear, the structure is not. While it is admirable for an author to experiment with a new writing style, the clarity of the work can sometimes be compromised. Eldot eventually explains—but not until the end of the book—that the narrative intentionally combines first- and third-person points of view as a means of freeing both writer and reader from “cumbersome conventions” concerning paragraph structure and punctuation. Eldot is a teacher with more than thirty years of experience; his frustration, or perhaps boredom, with convention is understandable. However, the resulting lack of clarity ultimately detracts from his work. Eldot’s message is, indeed, as important as ever. When it comes to sharing that message through mainstream media, however, revisions in defense of convention and organization would bring these already bright and positive chapters to greater light.